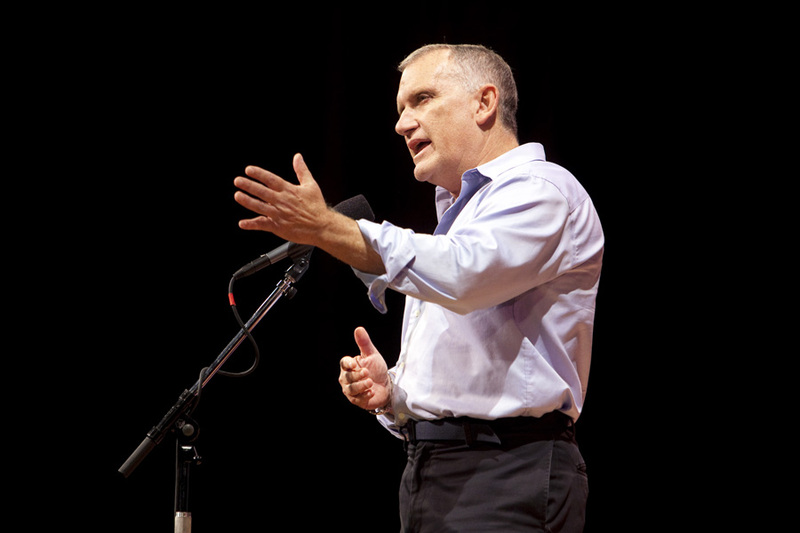 Alan at the Moth Mainstage in 2011. Photo by Sarah Stacke. We are heartbroken to hear of the death of beloved Moth storyteller Alan Rabinowitz. We met Alan in 2005. His first story, Man and Beast, about him overcoming a debilitating stutter to become a voice and champion for animals, is a beloved classic which was eventually turned into a children's book and short film. While working on the story, I would meet Alan at 7AM at the Bronx Zoo, where he ran their Wildlife Conservation Society (he eventually co-founded the conservation group Panthera). I'd get there before the zoo opened, and we’d drink coffee and work out the story beats (was always struck by the stillness of the zoo when you took away all the crowds.) We hit it off in our first meeting, and he told me about the cancer that was then lying dormant in his body, and which finally took his life this past Sunday. Alan was a hero who inspired so many people. Time Magazine once referred to him as "the Indiana Jones of wildlife conservation," and National Geographic called him, “a master problem solver who understood the interrelatedness of wildlife, habitat, and humans”. If tigers and other big cats do not go extinct in our lifetime, it will be a direct result of Alan's actions and life work. We had quite a few lovely meals together, many of them involving goat meat (this brought on by me teasing him about all the remote places he'd been to and meals he'd eaten). He even got me to eat a goat burger once. The last time I saw him, it was at his house in upstate New York. He tried for half an hour (unsuccessfully) to teach me how to throw a knife. Alan’s wife Salisa and their children, Alexander and Alana are in our prayers. I have read every book he wrote, and highly recommend them. I’d start with, Jaguar: One Man's Struggle to Establish The World's First Jaguar Preserve. Scroll down to the bottom of the page to hear Alan's Moth stories. See the time Alan made Stephen Colbert cry. Watch Krista Tippett interviewing Alan for On Being. Watch these 60 Minutes pieces on Alan. A severely stuttering child finds solace in speaking to animals. A man finds answers hidden in the canyons of the Himalayas.